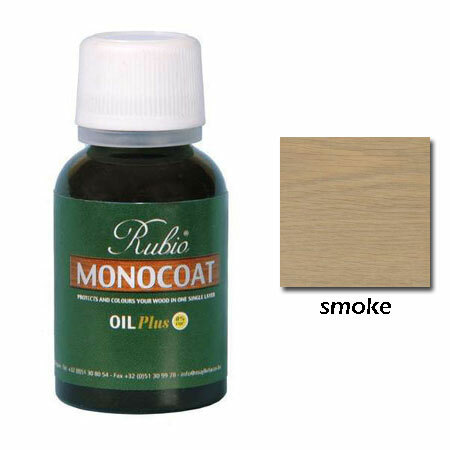 Rubio Monocoat Natural Oil Plus colors and protects your wood, producing a complete, extremely durable one-coat finish. Unlike traditional hardwax oils, Rubio Monocoat Oil Plus will connect with wood fibers by means of a molecular reaction, a result of which a durable protection is obtained. This molecular connection enables Rubio Monocoat Oil Plus to embed in the surface's upper microns immediately. The wood fibers can only combine with a certain amount of oil. Oil, which has not reacted, does not adhere and needs to be removed. Monocoat contains no volatile organic compounds (VOC), nor does it contain other harmful chemicals. - Low consumption - 1 liter for 300 to 500 sq. ft.
- 34 standard colors; although all sample colors are applied on white oak flooring, Rubio Monocoat can be applied to all wood species. - Color Oil: +/- 350 s.f. per liter. It is also available as Monocoat Oil Plus 2C with oil (part A) and accelerator (part B) - 1.3 liters can. Edger Disc Cutter 7" x 7/8"
Santos Mahogany High Output Wood Vent Flush Mount With Damper 4"x10"